A Frittata is an Italian version of an omelet. 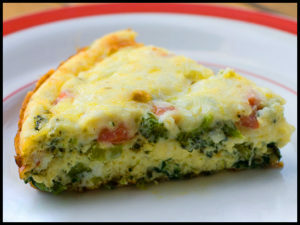 Often compared to a crust-less quiche or, in America, “scrambled eggs.” An Egg White Frittata is not only a healthy alternative to a high-carbohydrate and calorie filled breakfast, the Egg White Frittata is also easy to make and can be reheated as leftovers for a nutritious breakfast every day of the week. As this recipe is cooked both on the stove top and in the oven, a skillet that can withstand at least 400 degrees is essential. I purchased this Stir Fry Pan: https://www.amazon.com/Circulon-Genesis-Hard-Anodized-Nonstick-12-Inch/dp/B00GP408F2/ref=sr_1_1?ie=UTF8&qid=1473141518&sr=8-1&keywords=Circulon-Genesis-Hard-Anodized-Nonstick-12-Inch on Amazon and it works great.